Join us for the 13th Annual AzusaFest celebration, at the historic Azusa Street Mission Revival location! Come Worship the Lord with us and cry to the Lord for Revival in this nation!!! The winner of the William J. Seymour award will be announced! 3pm – 5pm – Azusa Prophetic School, includes training manual. 9am – 12pm – First Nations Prophetic Gathering- More details to come. 12:00pm – 12:30pm- Worship with “I Am Family Choir” A wonderful youth choir from Nigeria!!! 12:30pm – 2:00pm – William Seymour History Presentation & Reception, we will announce and honor the National 2019 William J. Seymour award recipient, Dr. Mel Robeck, Fuller Theological Seminary. Free & open to the Public! Consider giving a donation for the Azusafest budget: $5, $10 or $25 or any amount, every donation will be a great BLESSING!!! Click on this link to give online at Eventbrite. THANK YOU IN ADVANCE FOR YOUR GENEROSITY!!! For more information, call our office: 323-692-7268. We have many great surprises, more details to come! We invite you to volunteer for Azusafest from April 5th-7th, 2019. Set-up to completion and donations for the budget of Azusafest 2019! Click here to sign up as a volunteer on eventbrite! 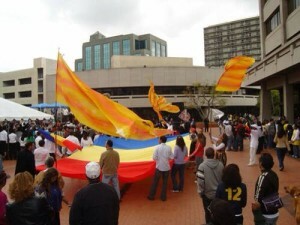 We invite people to bring flags & banners to Azusa street, Saturday April 6th !! !